Keeping bees is an expensive habit. 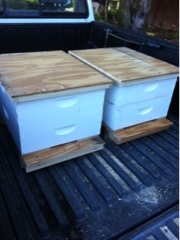 The frames, bases, lids, wax boards and bees themselves quickly run to $600-$700 dollars for each hive. Even to DIY, to buy the wood, assemble, paint, buy more wood and build inside frames and attach wax backer boards costs. A queen and about 3,000 bees, enough to get a new hive going, is over $100. The amount of honey taken from a hive each year can vary. There are honey bees (and many, many other types of bees) everywhere we walk on the farm. It has been wet and cool much of the summer, and honeybees prefer the weather to be above 72 degrees, sunny and no rain. Summer time they build honey stores, enough to last the winter. Enough honey must remain in the hive to support the queen and enough bees to keep her alive and healthy enough to make more bees next spring, when it is warm enough for blooms and pollen gathering. What is removed is for the beekeeper to offer as honey. Our existing hives have bees in them. We do not medicate our bees. Most beekeepers do: the assault on such a tiny animal has become untenable for most to survive. The integration of pesticides into a plant have an adverse effect, so do mites, parasites and the general use of weed killers, strong fertilizers and the like on lawns. Today we assembled more pieces to build empty hives. Put them out on the property, in separate spots. Some purchased parts, some homemade parts. No bees in them. We have learned that if we put empty hives out, bees will find it, explore it, maybe sometimes make a new queen and move her and a whole bunch of friends into it. After that, the honeybees fill the thing with wax and honey. It gets extraordinarily heavy, as the honey and all those bees weigh a lot. Placed on bricks or cinder blocks, these light weight structures, designed to mimic what a honey bee made hive is like in the wild, will become a new home. We hope. Come on over and visit us, stay awhile. We promise to provide lots of pollen loaded vegetables, fruits, berries, trees, shrubs and vines. No pesticides, organic or synthetic. No synthetic fertilizers. And at the same time we will leave plenty of bare ground so the native, single bees have spots to live and lay eggs. We all know that while the honeybee waits for warmth and sun, many native bees are jumping out of the ground and getting their pollen on. The lids and bases were painted to protect them from falling apart.